South Sudanese refugees continue to arrive in Gambella, Ethiopia, fleeing their homes because of the violence, and walking for days seeking safe shelter and food. By the end of June between 600-800 refugees were arriving at Burubiey transit camp each day, an increase from the 100-300 daily arrivals in previous weeks. Currently over 140,000 South Sudanese refugees are in Gambella since the outbreak of the current conflict in December 2013. Gambella’s main refugee camps remain crowded. Plans are underway to expand the new refugee camps of Kule 1 and 2, which have registered 51,476 and 37,287 refugees respectively. The old Leitchuor camp holds an additional 47,469 refugees. Although proper tents were distributed to refugees in Kule 1, Kule 2 and Lietchuor camps, many people in Kule 1 and Lietchuor camps still only have pieces of plastic sheeting to protect against the rain. New arrivals first stay in transit camps. The Burubiey transit camp, overwhelmed in May by an estimated 20,000 people fleeing the fighting in Nasir, was emptied mid-June. Refugees who were living under very difficult conditions were transferred to the permanent camps of Kule 1 and Kule 2. Because of the flooded roads, boats were used to transport the refugees. However, the camp is full again with the recent influx of refugees waiting to be transferred to the permanent settlements. More than 7,700 refugees are staying at Akobo and Pagak transit camps. Clean water is a critical priority for the crowded camps to drink, wash and cook. MSF runs a water treatment plant that produces an average of 1 million litres a day of safe water for refugees. With a daily target of 15 litres per person, people in Pagak camp receive the full amount, while those in Kule camp receive 14 litres, in Lietchuor camp, 10 litres, and Kule 1 camp, 8 litres. Sanitation and hygiene are also a priority. MSF has built two-thirds of the 1,200 latrines intended for the camps, and nearly all hand washing points, but so far 30 of the total 500 showers. In this context, malnutrition is a serious problem. Testimonies by refugees underline food and safe shelter as an important motivation for coming to Gambella. 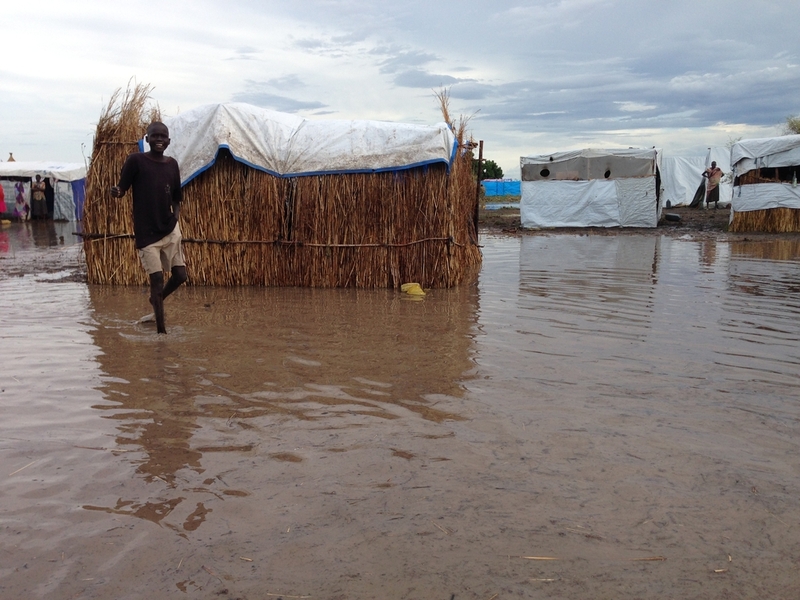 "In May, South Sudanese fled because of the fighting,” says Dr. Natalie Roberts, MSF medical coordinator in Gambella. “Now they say they have left their country because of food deprivation." New arrivals to Kule 1 and Kule 2 camps are already malnourished. Food distribution in the camps is fragile, forcing many women, for instance, to walk nine kilometers from Kule 1 camp into town to grind their grain. Malnutrition rates overall remained high in mid-June: 20% for global malnutrition and 6% for severe malnutrition. It is an improvement over the previous weeks but still above the emergency threshold of 5% of children suffering from severe malnutrition. Children are the most vulnerable to illness, contracting respiratory infections, diarrhea, and now malaria because the rainy season has started. Since the end of the measles epidemic in Gambella in May, those who are diagnosed with the disease now are mainly South Sudanese who just arrived. Cholera is another risk because of the epidemic in South Sudan. MSF expects to launch a vaccination campaign, with the approval of the Ministry of Health, the Administration for Refugee and Returnee Affairs (ARRA) and UNHCR, for a target population of 130,000 people, including refugees and residents. MSF conducted 35,361 medical consultations in Lietchuor camp and in Itang, since early March, and 2,523 medical consultations in Kule 1 and Kule 2 camps over one week in mid-June. During the same period, MSF treated 812 malaria cases in Lietchuor, Itang, Burubiey, Kule 1 and Kule 2 camps, and these numbers are likely to increase. And MSF provided care to 1,060 children admitted in the two intensive therapeutic nutritional centres between March and July. Finally, MSF managed to decrease the mortality rate at our two hospitals in Lietchuor camp (100 beds) and in Itang (130 beds) near Kule camp, respectively to 11% and 7% late June. But the situation may deteriorate with the rainy season and the surge of related epidemics. MSF is currently delivering medical care to South Sudanese refugees in Pagak transit camp, Burubiey transit camp and the three refugee camps of Lietchuor, Kule1 and Kule2 as well as in Itang. Furthermore MSF continues to deliver water and sanitation services to Pagak, Kule 1, Kule 2, and Burubiey camps in Gambella, Ethiopia.